I bought a really nice 442 last spring and I have been questioning myself if it is an original 442 or 1 that was pieced together. I really wanted to try and get the CCC system to work properly again and keep the car as original as possible, minus the headers I added. I am really torn between trying to keep it original or rip the 307 out and replace everything with something better. LS ? The vin and body tag on the firewall both confirm that the body is a Vin 9, but according to my RPO codes on the trunk lid it shows items that my car doesn't have. I should have a power antenna, but it does not exist. 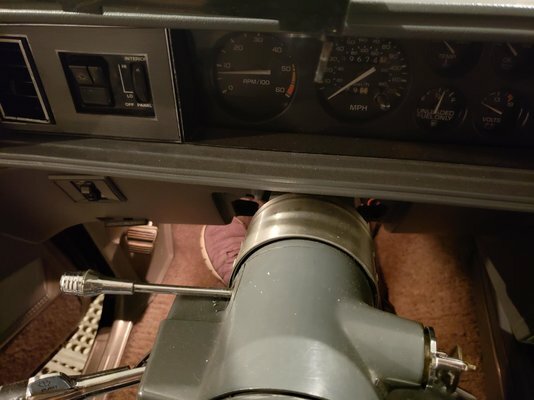 I have the floor shifter, but my steering column was from a column shift car. it doesn't have the lever, but there is a chrome cover around where it should have been that rotates when I shift from the floor. The interior trim on the TTOPs is maroon instead of grey. The front bumper has what looks to be junkyard markings, I'm sure Olds didn't mark the bumpers "87-88 Cut" at the factory. I also bought an original GM Service Manual and noticed that the wiring diagram for a VIN 9 doesn't use a Anti Dieseling Solenoid, but I have the wiring and plug for it next to my carb. I have been tracking down other issues with the electronics behind the dash, not sure if my ECM is bad, or if there are other sensors bad under the hood. There also seems to have been quite the hack job to most of the wiring under the dash from looked to be an older alarm system. I guess I'm just looking for suggestions. I love the car, just want to be able to enjoy the hell out of it without fighting a 32 year old computer. What would YOU do? and no I do not have an unlimited budget. I have the same year make and model as you. I even have the same paint job. It sounds like you have one of two scenarios: you own an actual 442 that has undergone a lot of repairs and modifications OR you have a Cutlass Supreme with a replacement VIN tag. Either way, it seems like there have been too many modifications to turn back the clock. My advice would be to make it into the 442 that you want to own and drive. I'd start with replacing the underpowered 307 with a 350 if it were mine. I vote 403 and lose the CCC even after seeing LS in a 442 post. Find the RPO sticker and start matching stuff up. If possible post a pic of the spid label in the trunk. Btw the vin should also be on the spid label and should match the vin on the dash, also W42 should be on there that's the rpo for the 442 package. A real 87 vin 9 car will also have a 120mph speedo, gray dash trim plates instead of woodgrain, a heat shield above the passenger side tailpipe to protect the fuel lines, a dual snorkel air cleaner, trans tag code will be KZF, an 8.5 inch rear rpo G87 with a 3.73 ratio rpo GT4 and if its a posi rpo G80. Junkyard bumper indicates it was probably wrecked at one point the antenna may also have been replaced with a non power unit , the power ones go bad all the time and can be expensive to replace. as you point out it's a 32 year old car , with 32 years of history. RPO Codes not matching ? just the power antenna ? appears it was replacement with fixed mast replacement.....pretty common. not too many original power antenna's last for 32 plus years. 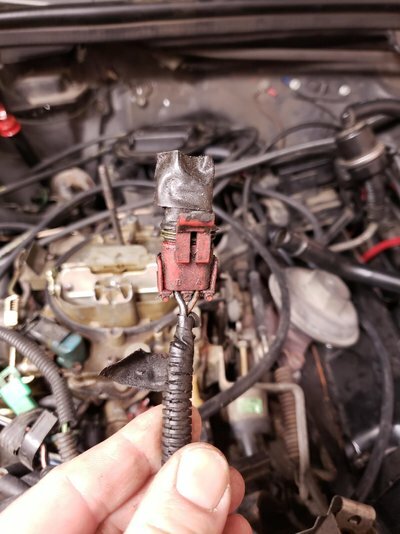 this Anti Dieseling plug , is it green ? could it be a port for dealer use .....smarter than me 442 owners will fill in the the real name & reason for this .picture's are required . front bumper with junkyard marking, well a front end accident and junkyard replacement part solves that mystery. again 32 year old sensors' , vacuum lines have they been replaced and correctly ? you added headers , is the O2 sensor still in the exhaust stream ? Steering Column ,not sure what you mean by a chrome cover ? picture ? hack job of wiring , maybe from a old alarm .....not surprising. How is it running now ? if your not on an unlimited budget , forget LS and you will be shocked by the cost of rebuilding a OLDS 350.
keep it 307 for now , and maybe in future do the olds 350 swap. Welcome! The way I see it is. The hard part is all ready done for you. The paint and body. Who cares if it is a real 442 or not? Not worth much more if it is, and it's not like it every was a performance car anyways. Make it into what ever your heart desires!